CREATE A CASUAL SETTING WITH THIS TRADITIONAL GLASS PLATE. BEST USED FOR BUFFETS, LUNCHES AND DESERTS. BEST PART IS WHEN YOU RENT OUR CHINA, WE ARE ON CLEAN UP! SIMPLY SCRAPE OFF REMAINING FOOD AND RETURN TO MILK CRATES POST EVENT. AVAILABLE PIECES ARE SALAD PLATE AND BREAD&BUTTER. 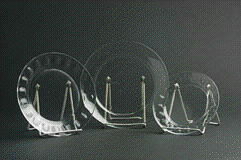 * Please call us with any questions about our glass china rental in Baltimore Metro area.